Filmmakers Loren and Matt Feinstein provide an eye-opening account of the downside of alternative, food-based fuel sources. Delving deep into the world of agrofuels and monocrops, they explore how the increasingly common practice of diverting food crops to the industrial production of cellulose-based fuels is devastating indigenous communities, undermining small farmers, and endangering the environment across Latin America. Turning to the promise of the future, they also show how grassroots communities are developing better, cleaner alternatives. A good resource for courses dealing with the global economy, development issues, and the environment. "A wake-up call. Documents with great clarity the destruction of farming soils, forests, common lands and livelihoods by first and second-generation agrofuels in the name of energy security." "A good introduction to some of the devastating consequences to local communities and the environment caused by large-scale soy and sugar cane production in Brazil. Helps us ask important questions about so-called 'green' energy." 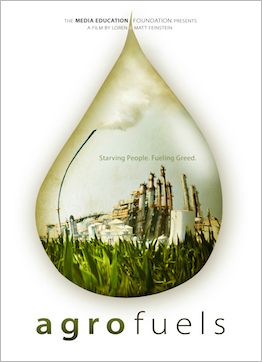 "Contrary to the promoted perception of biofuels, this film argues forcefully that they are not the solution to the world's energy problems and that they increase problems for the environment, rural inhabitants, and indigenous peoples... For those who are committed to 'biofuel,' this is an essential watch."